5 - 5,5..........Alf von Hagenfreund. 5 - 5,5..........Dina von Klockenhof. 4 - 4,4..........Lump von Hagenstolz. 5 - 5.............Alex von Kleinwaldheim. Jago von Beelen lived to 10½ years of age and passed the Körung 'for life' with highest rating for hardness and working drives. His maternal grand-sire, Vello von Fürstenfeld, competed in the D.V. Meisterschaft and also passed the passed the Körung 'for life'. 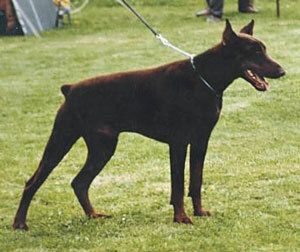 “Jago was an excellent red male. He won the Bundessieger title in 1972. Mr. Hirscher the German judge wrote: “a very strongly built male with a good head, reasonably dark eyes, correct dentition, good stop. Good neck flowing correctly into topline. Good topline and correct hindquarters”. Jago became an international Champion, a German Champion and DV-Sieger. He passed his Schutzhund II with a score of 72-83-82. He passed the Körung 'for life' with Class 1. Bronco: SchH 3, sire of the vom Heiderhof “A” litter (Alexa); vom Binselberg “Q” litter (Quecke; Queen); vom Kirchbühl “K, M” litters (Muse) and vom Gaxhardter Wald “I, K” litters (Ilk; Kessy). Egor: SchH 1 and sire of the van de Groote Maat “A, E, F” litters (Ebo). Ben: SchH 3, FH and sire of the van de Eland “H” litter (Hertogin, Holly) and vom Holzbergerhof “I” litter (Ina). Amon: sire of the vom Reuschenberg “A” litter (Aschra, Assna). Britta: SchH 2 and dam of the vom Nettetal “A” litter (Anuk). Araf: SchH 3, DV-DM participant and Landesmeister Westfalen in 1986. Aimee: SchH 1 and dam of the vom Hause Ehrlich “I” litter (Ingeborg).